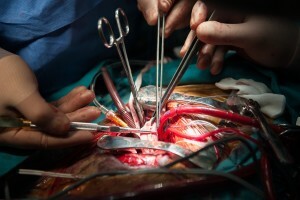 Open heart surgery during a cardiopulmonary bypass is the only effective approach for some diseases that require an access to the heart chambers or the great vessels; even when a temporary inflow occlusion is chosen as an alternative, only a very few “time restricted” procedures could be done on a beating heart. However, when considering an open heart surgery, the high risk of intra- and post- procedure complications often outweighs the benefits. In veterinary medicine the financial weight of such a procedure is also a limiting factor. 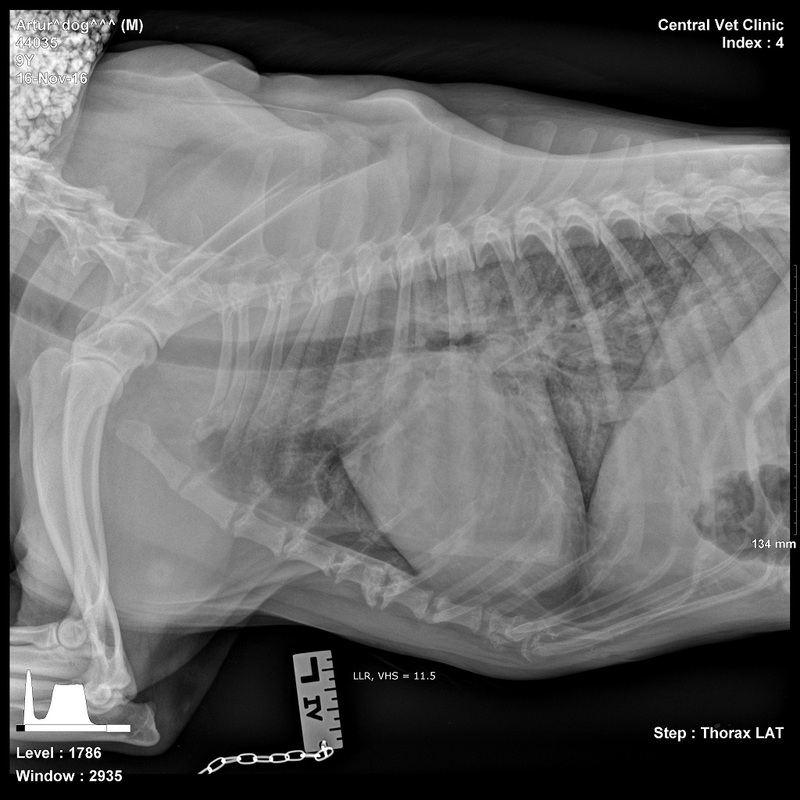 We would like to share a case where a temporary sinus arrest was induced during a cardiopulmonary bypass and a huge mass was successfully extracted from the left atrium of a dog with an open heart approach. 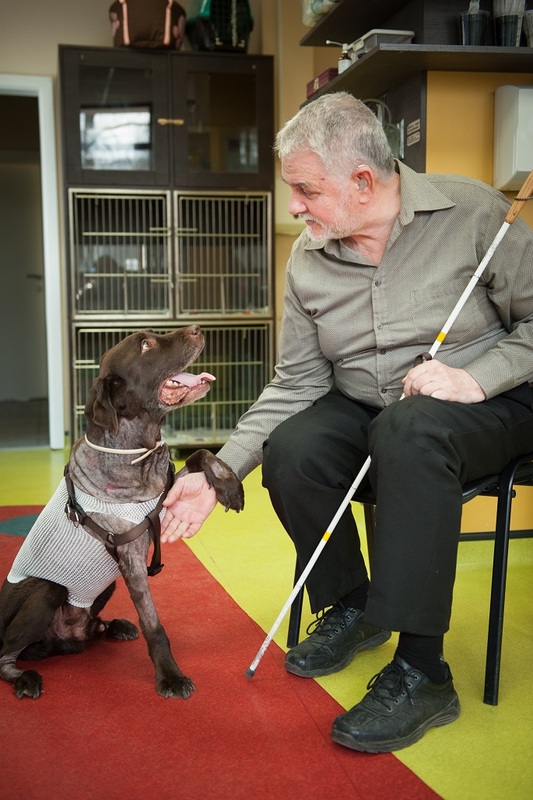 Arthur is a 9 year old MC Labrador, trained like a guide dog for a blind person, admitted because of increasingly frequent exercise intolerance episodes during the past few months. Furthermore, the last week the patient was very weak and experienced several syncopal episodes. 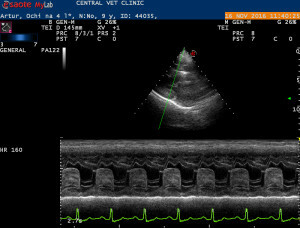 On a clinical presentation with the referring vet а tachycardia and dyspnea were noted and the patient was referred to us for a Cardiology consult. 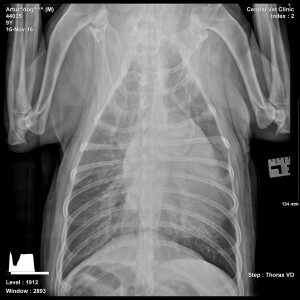 On physical examination, the dog weighted 25 kg, with a history of a rapid body mass loss for the last couple of months. His “normal” weight has always been around 32 kg according to the owners. 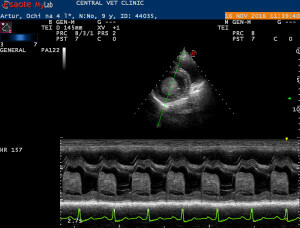 The body condition was poor (score 2/5) and the dog had a grade II/VI left sided apical soft diastolic heart murmur. Lung auscultation was unremarkable, but the respiratory rate (RR) was more than 50 breaths per minute. 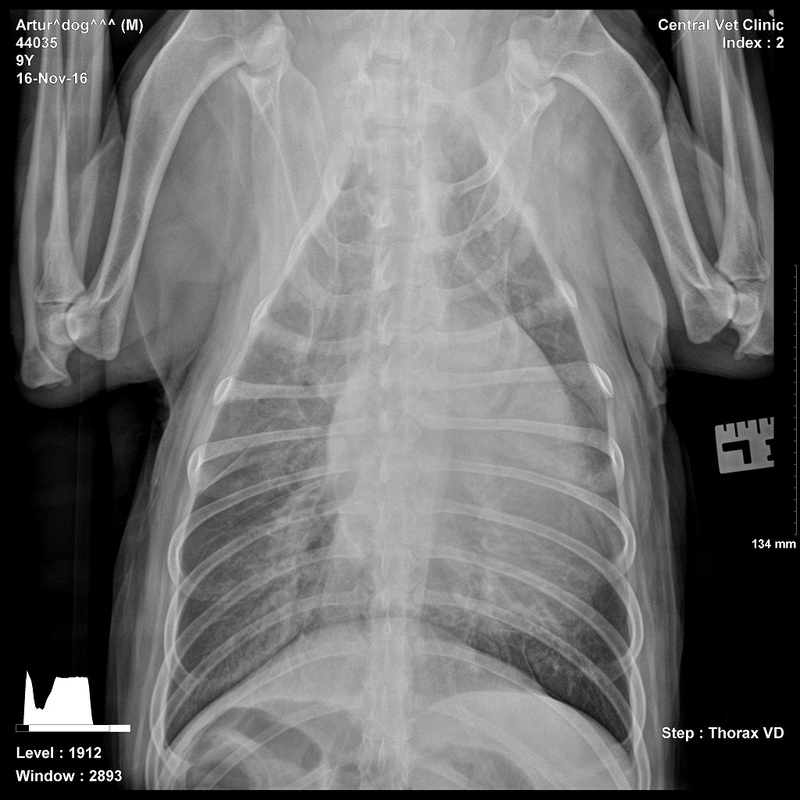 The X-rays of the chest were highly suggestive for e left sided congestive heart failure and showed mild generalized cardiomegaly with a VHS of 11.5 with enlarged left atrium and left ventricle. 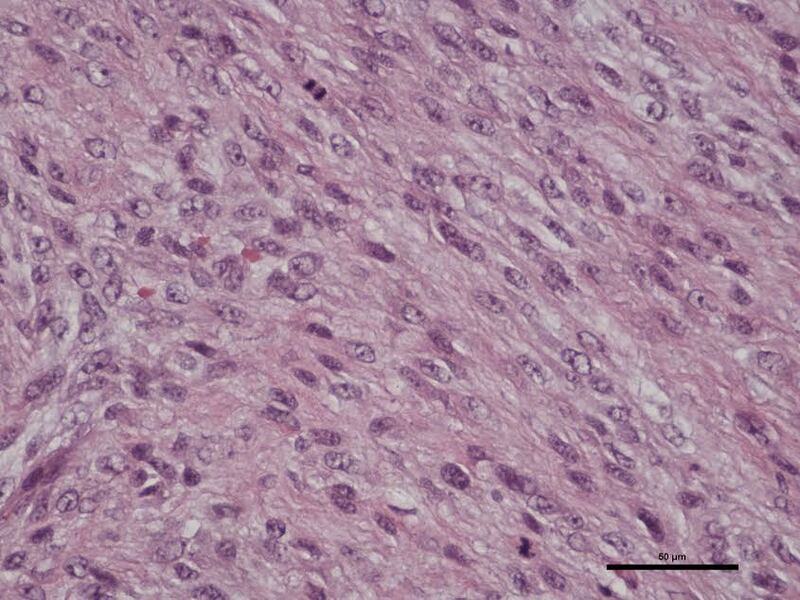 The pulmonary veins were slightly larger than the pulmonary arteries; the lung parenchyma with diffuse interstitial pattern in the area of the hilus. The patient was already on Furosemide in a low dose – 2mg/kg twice a day for the last two weeks with no improvement of the clinical signs. 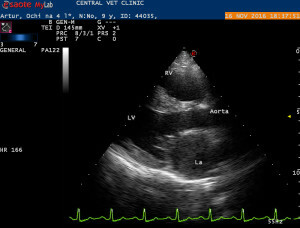 A transthoracic echocardiography was done with the patient in lateral recumbence through the right and left parasternal windows. 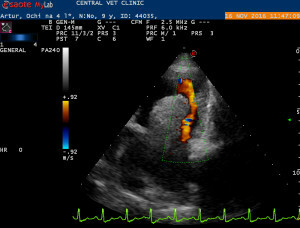 A huge echogenic mass with irregular shape was observed in the area of the left atrium – attached to the intra atrial septum and prolapsing through the mitral valve during diastole towards the left ventricle. The mass was creating almost full diastolic obstruction of the valve, allowing only a tiny fraction of the blood in. 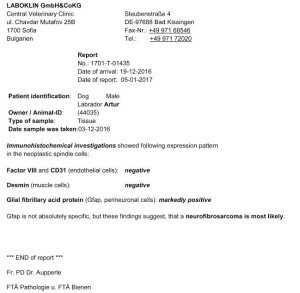 Complete blood count, electrolytes and biochemical profile were normal. During the abdominal US study no further abnormalities were noted and no more masses found. On the ambulatory ECG a normal sinus rhythm was recorded with multiple atrial premature complexes. The blood pressure was normal. A hemo-culture and a urine culture were obtained and came back negative for a bacterial growth. The bleeding time and the Pt/APtT were normal. 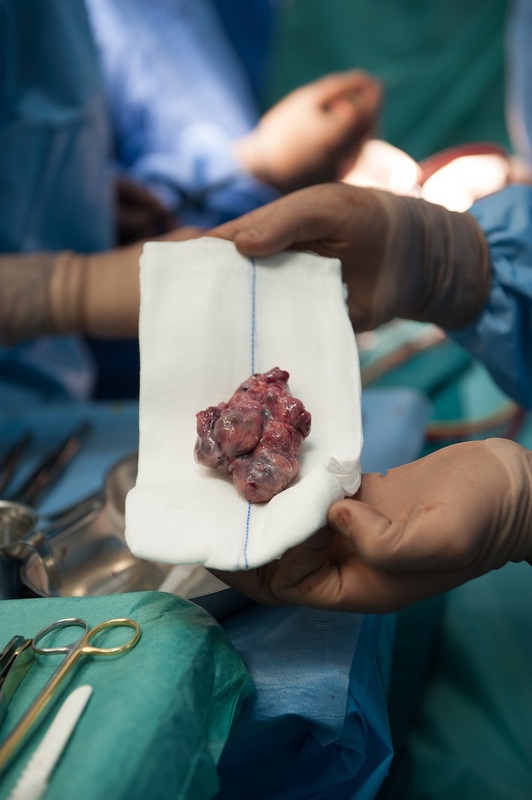 A diagnosis of an intra atrial mass with clinical signs of a progressing left sided congestive heart failure was made and a surgery was discussed. Because of the location of the mass no surgical or interventional approach was possible without the aid of a cardiopulmonary bypass (CPB) and cardioplegia. 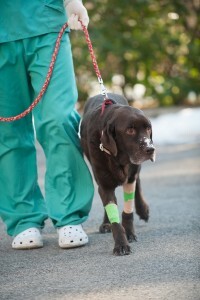 All the risks and possible complications were discussed with the owner and a decision for such a surgery was made. 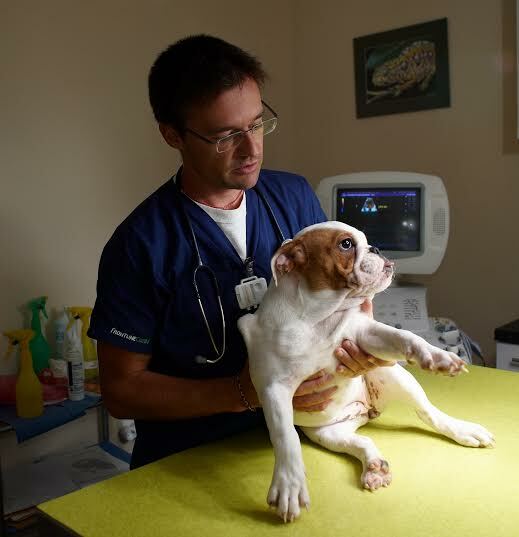 The team for the surgery was from a veterinary surgeon, human cardiovascular surgeon, cardiovascular perfusionist, veterinary and human anesthetists, and nurses. 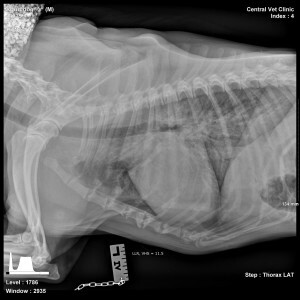 The procedure was done in Central Vet Clinic, Sofia on 3rd of December 2016. The surgical approach was through the left fifth intercostal space with a standard lateral thoracotomy. Additionally the left carotid artery was approached and prepared in case it is needed for the CPB blood return. 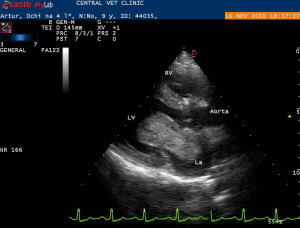 The pericardium was excised and the left atrium, the big vessels and the left ventricle visualized. Then three cannulas were put – the one collecting the venous blood inside the right atrium (through the right atrium auricle), the one returning the oxygenated blood from the CPB machine into the ascending aorta and one small cardioplegique cannula into the aortic root over the coronary arteries. 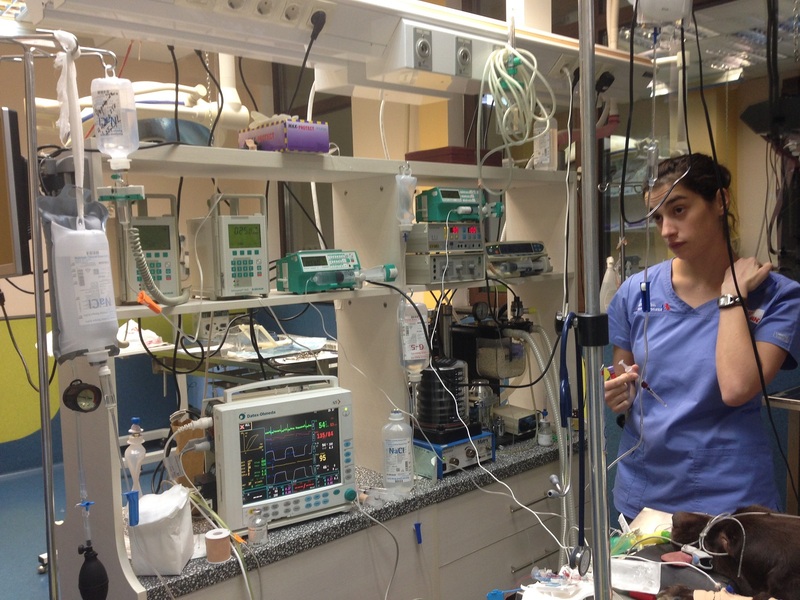 Then a bolus of Heparin was injected iv in a dose of 800UI/kg and 5 minutes later the patient was switched to the heart-lung machine (Sorin 5 and a pediatric oxygenator with 360 ml prime). 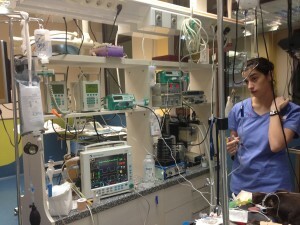 Then we started a controlled cooling of the patient using a chiller, connected to the CPB machine. When the target body temperature of 28o C was reached the ascending aorta was cross clamped and a 600 ml of cooled to 4o C crystalloid cardioplegique infusion rich in potassium was infused through the coronary cannula producing complete heart arrest. 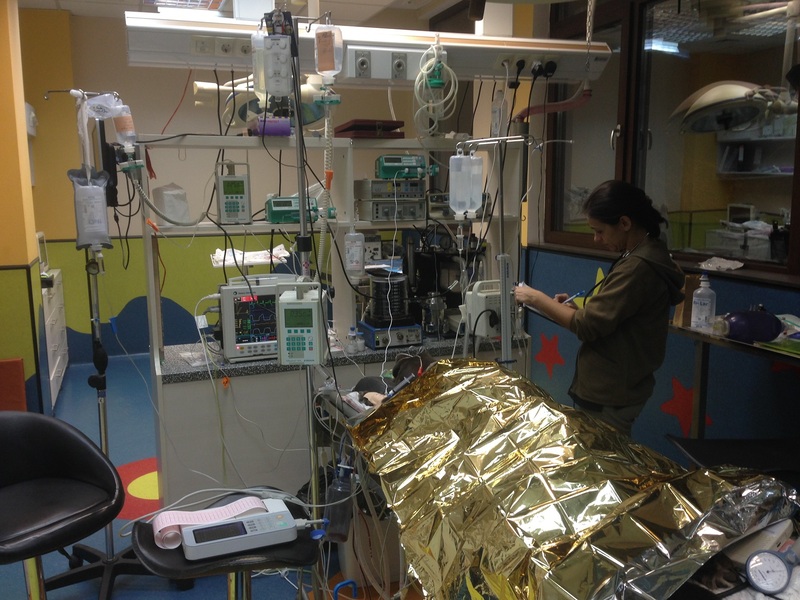 We stopped the active ventilation of the lungs and the patient became fully dependent of the heart-lung machine. The heart was open through a 5 cm cut into the left atrial wall starting from the auricle tip. The mass was directly visualized and excised. It was connected to the intra atrial septum with a relatively small neck. We removed it without creating an ASD. 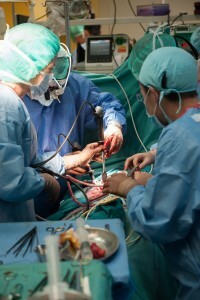 The air from the heart was evacuated and the surgical cut closed with a 5-0 Polypropylene suture in a continuous way. 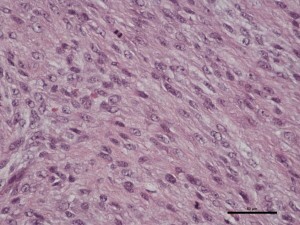 The mass was a solid and well defined structure with irregular shape and was admitted for histology. The size was 8/6/4 cm. We started a slow rewarming of the patient with a target body temperature of 38o C. Two epicardial electrodes were embedded and connected with an external pacemaker. Once closed and warmed, the heart was gently massaged manually for a couple of minutes and then hit with a direct pediatric defibrillator. We used 5 to 20J of energy shocks and got a slow and then faster rhythm after the 9th try. 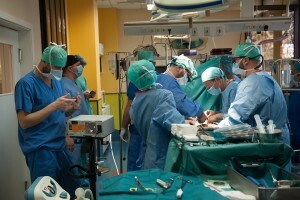 The external pacemaker was switched on and put on a 100 bpm rate for the next 12 hours. The surgical closure was uncomplicated and no significant bleeding was noted. The patient received slowly iv Protamin (1mg/100IU Heparin) as a Heparin antidote and the heart-lung machine was gradually restricted and then switched off. 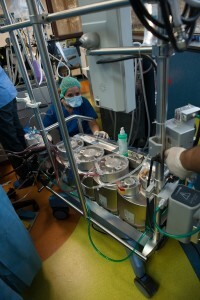 Two chest drains were put and connected to a sterile active suction. The total machine time was 130 min, the sinus arrest time – 22 min, total surgery time – close to 5 hours. 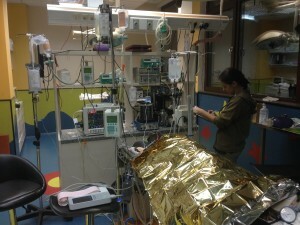 Immediately after the CPB machine was stopped a hemotransfusion with two units of fresh blood was done. Arthur recovered from the general anesthesia slowly over the next 12 hours, but he was unable to stand on his feet for additional 5 days. The electrolyte levels, liver and kidney values were monitored almost every hour for the first 2 days and then three to five times a day; our main concern was the potassium blood level and we tried to maintain it stable at all times. The urine production was also constantly monitored and tailored to be in the normal range – with diuretics and blood pressure control drugs. From all the possible complications after a CPB we saw only a transient neurological signs attributed to some degree of brain injury – interpreted after the neurological exam as left sided forebrain lesion – ischemic or hemorrhagic. 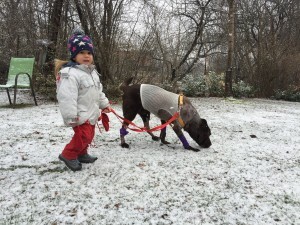 Arthur recovered completely both physically and mentally for the next two weeks with a lot of supportive care and physiotherapy. On discharge from the clinic he was able again to do all the things a blind person guide dog is trained to do. 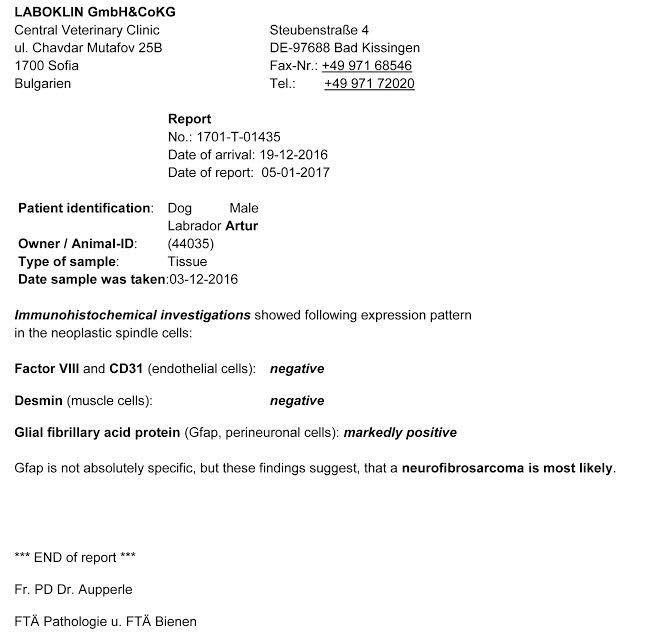 The histology report was made in a referral laboratory in Germany – Laboklin, and after the immunohistochemistry stain came back as a Neurofibrosarcoma. CPB is a routine everyday procedure in the human hospitals, usually carrying a good to excellent prognosis and very low mortality rate. On the other hand in the veterinary medicine field is still an exotic and very risky one. Although very demanding both for the clinical team and the patient himself, the cardiopulmonary bypass is the only option for cardiac diseases requiring an open heart surgery. We believe that a close relationship between a human medicine cardio surgical team and a small animal hospital team could make this type of procedures safer and better recognized. We have done regular monthly rechecks on the patient with echocardiography and X-rays since then and now six months later Arthur is doing great, no drugs or any supportive therapy needed. He gained back his usual weight and is working like a guide dog every day.